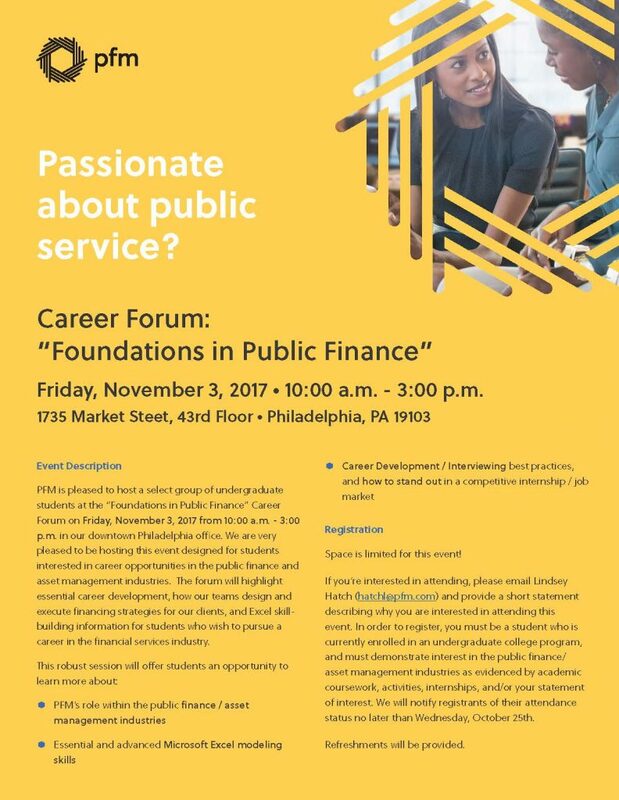 On Friday November 3rd, PFM will be offering a career forum in our Philadelphia office for students who are interested in building knowledge and skills for a career in the public finance or asset management industries. The session will highlight how our teams design and execute financing strategies for our clients, Excel skill-building, and a mock-interview career development session customized for students who are looking for internships or entry-level opportunities in the field. The attached PDF has some additional details for your review as well. Space is limited, and we are finalizing registration within the next few weeks. To register, please have interested parties reach out to me, PFM’s Recruiting Specialist (hatchl@pfm.com), with their resumes and a brief statement of interest. If you would like to learn more about our firm, please visit www.pfm.com. I am also happy to answer any questions that you or your contacts may have.